Let us help provide a fun way for people to donate CASH to your Food Bank on any kind of device. The system can easily interface into your existing web site and provide a new alternative outlet to donate. 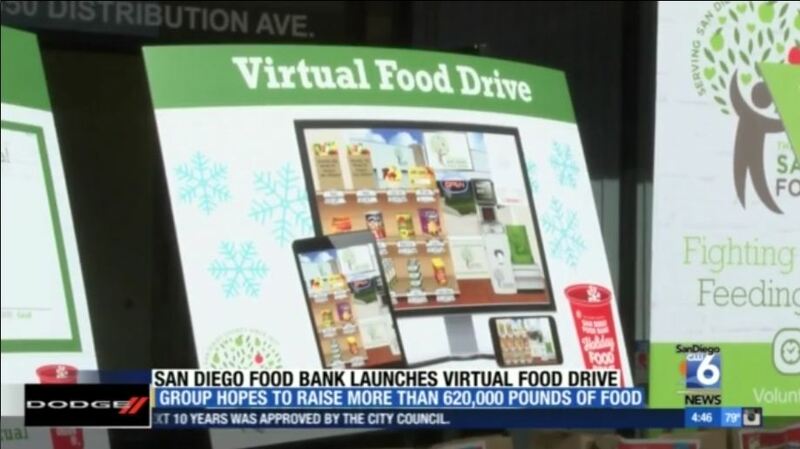 This Virtual Food Drive system is supported on all devices from iPads, iPhones, Android devices all the way to laptops and desktop PCs. 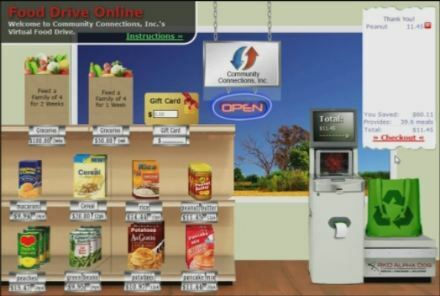 Designed to look like a grocery store, donors select "items" from the shelves as if they were buying food to donate. As they scan items, they see the multiplying factor of their dollars translated into meals for the hungry, as well as their savings from buying food themselves. "I thought it was a fun addition, kind of like a game." "From my perspective, it is easier than buying food to donate…"
"I really like this and it is being talked about all around (work) because so many of us pool money and go buy food items for the drive and this is much easier and I get an immediate receipt. Also the whole click and drag items to the scanner makes it fun!" This full-featured Custom Campaign Manager allows you to quickly create virtually unlimited sponsor-specific Virtual Food Drives, allowing you to host corporate challenge fundraising campaigns within minutes. Your choice of shelf "items" including images, names and prices. "Meals Provided" calculation based on your current pounds-per-dollar average. "Savings" calculation based on your cost versus the donors. Appropriate Background image showing local skyline or geography. Custom disclaimer and contact information at the bottom of the page. Virtual Food Drive Customization and Activation. Includes customization as described including your logo and selection of items and pricing. Assumes donation output to your existing secure online credit card donation area, or we can create a secure online credit card processing interface to work with your bank. Includes monthly donation activity reporting via email. Includes telephone and email support with your Food Bank staff as needed. One-Time start-up charges include first year of hosting and maintenance on our Internet servers. Never any per-transaction or donation-based charges. All costs fully predictable and reasonable. Please call or email for pricing specific to your Food Bank's needs. We can also incorporate a fully hosted secure credit card solution for your online donations. Created and Maintained by Community Connections, Inc. | Marketed Exclusively by RKD Alpha Dog Marketing.